A recurring aspect of my trip has been the fact that I’ve been pleasantly surprised by the most unexpected things. My last post on Bohol touched on this theme, and I guess it’s something that could be said about my time in the Philippines in general. After a week on Bohol, I got the feeling it was time to start thinking about moving on. Don’t get me wrong; I could quite happily have lounged around in a hammock on Bohol for much longer, but the Philippines is a big place and there were so many more islands to see! As you know, I take an incredibly laid back approach to planning and by that, I obviously mean that I don’t plan at all. It’s an approach that served me very well – until I came to the Philippines! The fact that the Philippines is made up of over 7000 islands makes this approach slightly problematic. To move on to most destinations, you have to buy a ticket for a boat or – as is the case more often – a flight. This is far from ideal for someone with my approach, as I regularly make my decisions on the day, or the day before at the very earliest. Unfortunately in the Philippines, this seems to be the time when the prices of flights shoot up. As I logged on to my usual trusty sites – Skyscanner and Kayak – I was shocked to discover that flights from Bohol to my planned (I use this term very loosely) destination of Palawan were over £100 more expensive than most other flights, and most included a 15 hour transfer in Manila. Back to the drawing board. I had already resigned myself to not seeing the famous rice terraces of Banaue in North Luzon, as getting around the Philippines was difficult enough without the added inconvenience of a flight back to Manila and the 10 hour overnight bus ride that would follow. 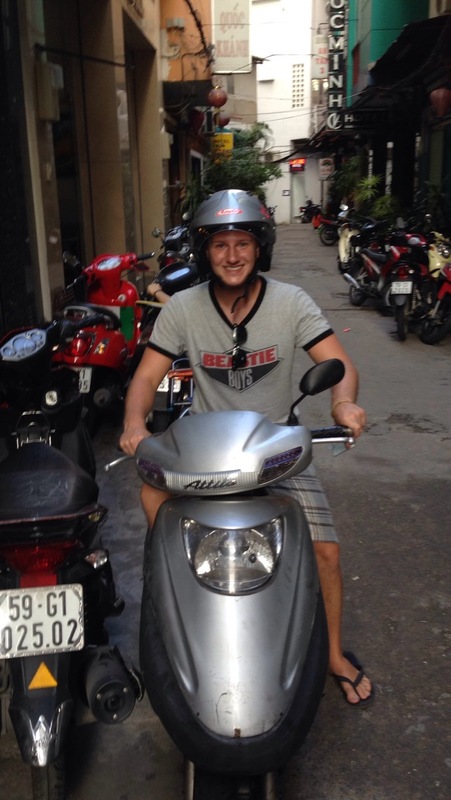 After a couple of overnight buses in Vietnam last year, I’d made a pact to myself that I would do everything in my power to avoid riding another – including motorbiking up an entire country. Despite this, just two days after my shock at the cost of a flight from Bohol to Palawan I found myself sat in the Oyahami bus terminal in Manila awaiting said 10 hour overnight bus. B) Fly to Manila for £100 less, spend less than a tenner on an overnight bus, spend a couple of days up in Banaue at the rice terraces and get the bus back down to Manila a few days later before flying to Palawan for £40. Hands up who’d choose option A. Didn’t think so. 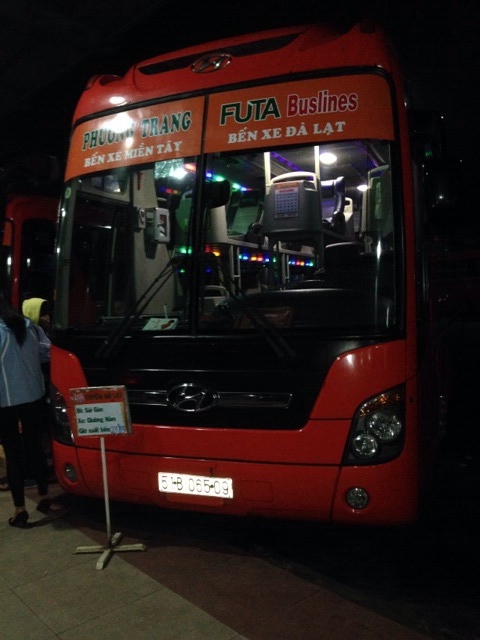 Overnight bus: we meet again! Upon taking my seat on the bus, I thought I’d made a huge mistake. The screen at the front was blaring out what can only be described as the worst film of all time. Worse than Anchorman, seriously. If you’ve ever found yourself drunkenly perusing the movie channels on Sky late at night and stumbled upon the wonderful bad ‘Nollywood’ channel, then you’ll know what I’m saying when I say it was that bad. Hang on, you don’t drunkenly watch low-budget African films with criminally wooden actors and wobbling sets?! You’re missing out. With a bit of luck, however, the DVD seemed to crash just before we set off from Manila and we were put out of our misery. I say put out of our misery, but I must admit that despite it being absolutely terrible I was rather intrigued by how it was going to end. Sadly, I never got the name of the movie. Bummer. Thankfully, I made friends with another solo backpacker – an American girl called Leslie – and we kept ourselves entertained throughout the night as we swapped travel stories, slagged off half the people on the bus and generally put the world to rights. We also had a good giggle at the music that was played on the bus throughout the night, as it appeared to be a compilation of the worst power ballads ever you’d never heard interspersed with a few classics from the likes of Phil Collins and Tom Jones. I’m not entirely sure who decided it was a good idea to blast music out on an overnight sleeper bus, although some of the dreary nonsense could have acted on a sedative on less bumpy roads. We arrived in Banaue bleary-eyed and were immediately bombarded with sales pitches for rice terrace tours and accommodation. After about two hours sleep (optimistic) and no coffee, we decided to go to a local cafe and get our bearings before committing to anything. 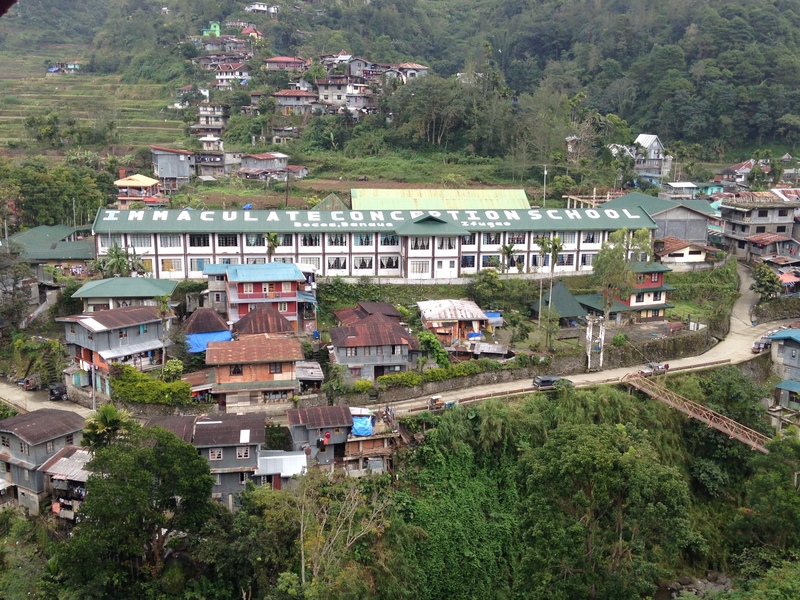 It turned out that Leslie had already unknowingly booked a room in Segada – an additional three hours from Banaue – so the first priority was accommodation for us both. 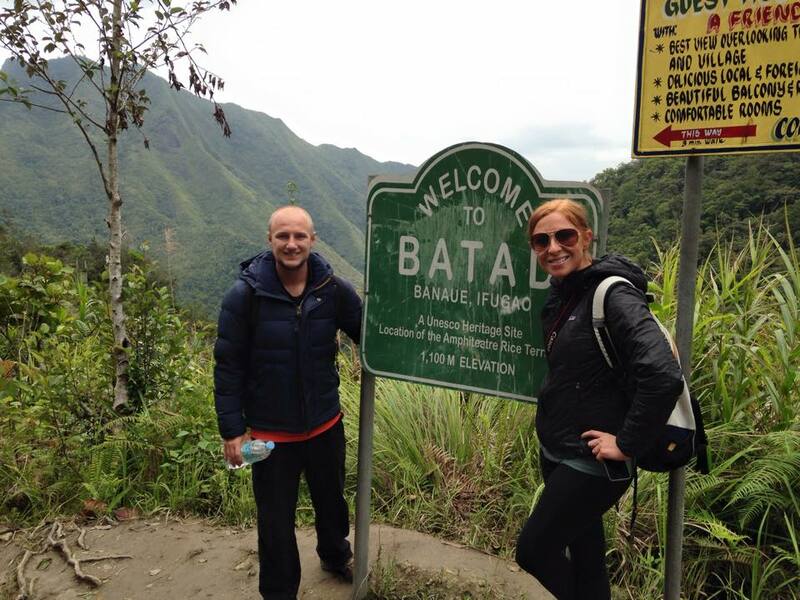 Thankfully Banaue is a very small place with only a handful of options so the choice was pretty easy. We settled for a twin room at People’s Lodge for a suspiciously low 400 pesos for the pair of us – that’s just over a fiver! Granted, the room didn’t have plug sockets, or for that matter anything but two beds and a table, but you get what you pay for. Room with a view – for less than a fiver! As we were both absolutely shattered, we decided to keep it local and just do a short hike through some local villages before winding down for the night and checking out the main event the next day. Our intention was to spend our second day at the rice terraces before getting the overnight bus back to Manila that night. We rose bright and early, had our coffees and were all set to get a ride up to the terraces…right after I’d visited an ATM. The problem with the ATM in Banaue is this: there isn’t one. In fact, the nearest ATM is in Legawe – an hour away in a jeepney. Now, I like jeepneys; they’re essentially revamped old military jeeps leftover by the US Army and they run on set routes like buses. They’re cramped and fairly slow, but they get the job done and they’re super cheap. However we had our bus ticket booked for 7pm that night, and a two hour round trip as well as an hour in Legawe due to issues with my card wasn’t ideal. By the time we arrived back in Banaue it was pushing 2pm; safe to say time wasn’t on our side. We quickly arranged a tricycle driver and a guide (apparently we needed one to make sure we got back on time…alright then) and we were on our way. A 40 minute tricycle ride was followed by a hike for around 45 minutes and – despite the cold weather – we’d worked up quite a sweat. It was all worth it though, as the rice terraces were stunning. Despite being ever so slightly rushed we still had time to take a seat at one of the restaurants in the village and grab some lunch overlooking the terraces, which was one of the nicer lunch views I’ve had! Sometimes you have to just stop and take a breather, look around and appreciate where you are. I’ve had moments like that in the hills in Vietnam, at the Great Wall of China and on top of the Sydney Harbour Bridge as well as countless others. This was just another to add to the list. I’ll let the picture do the talking. Sometimes, pictures say a lot more than words. Even though we didn’t get a full day there, the pair of us agreed we were more than happy with the experience and that we’d seen what we had come to see. 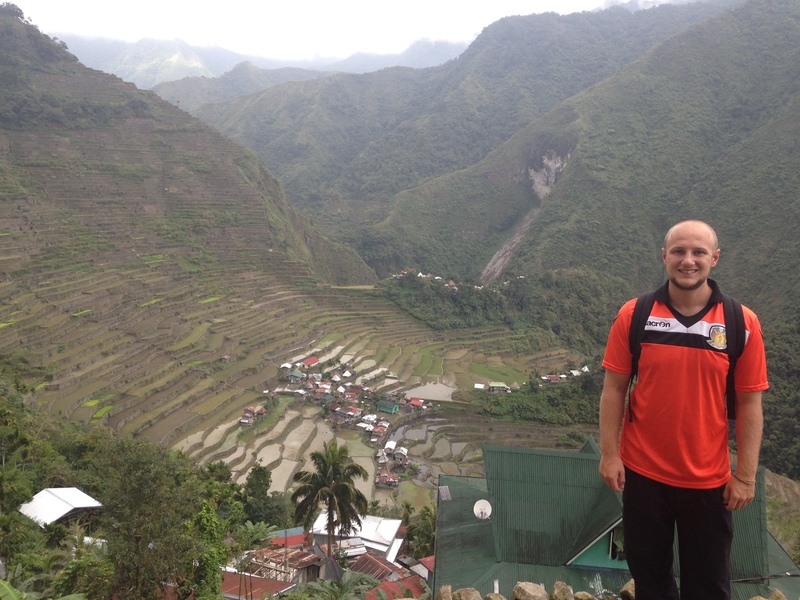 I hadn’t even planned on heading to Banaue whilst I was in the Philippines, so it was more than enough for me. Before we knew it, it was time to get back on the bus and head back down to Manila. Thankfully – with the help of a sleeping tablet – I was unaware of the movie or music on board throughout the night, if indeed there was any. Bliss! Brilliant reading Jack! almost felt like i was there! keep em coming! Cheers Jan! Glad you enjoyed it. Haha – to be honest it was a little nippy but nothing I couldn’t handle. Just arrived in Ulaanbaatar which is cold!